What is Solvit Telescoping Dog Ramps? Is your pet having difficulty getting into the car, onto the couch or bed (assuming you want him or her there!) or up the stairs? Don't risk injury to yourself or your pet by trying to lift and carry him or her. There is another solution. The Solvit Telescoping Dog Ramps are perfect for all pets who need assistance reaching high places. 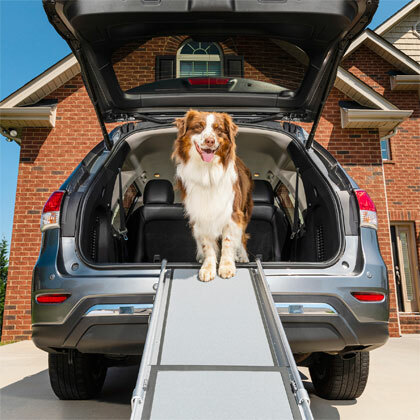 Once you've installed the Solvit Telescoping Dog Ramp to your car, your couch, or any other high surface you want your pet to get to, you'll be able to guide your pet to and from that location without straining your back or risking injury to you or your dog. The case can be used to protect the Deluxe Telescoping Dog Ramp from wear and tear. It's easy to use - just open the case completely to put the ramp inside. Secure the zipper to close the case and store or carry with you. If the safety release strap (on underside of ramp) is not engaged, it is possible for the ramp to extend automatically if held in a vertical position. Please use care when holding the ramp this way. The Solvit Dog Ramps are designed for use by pets, such as dogs, cats, and small animals only. It is not intended to carry humans or heavy loads. Using the ramp in this way voids the warranty and creates an unsafe situation! Please follow this guideline strictly. For your pet's comfort, we recommend that you let your pet to become familiar with the ramp before using it for the first time. To do this, lay the ramp flat on the ground, and place treats or other items familiar to your pet on the ramp. Train your pet to walk on the ramp while it's in this position before using it in an inclined position, offering praise and reassurance along the way. As your pet gets used to the ramp, gradually incline it and continue training before using with a vehicle or other higher surface. If the safety release strap (on underside of ramp) is not engaged, it is possible for the ramp to extend automatically if held in a vertical position. Please use care when holding the ramp this way. Make sure the rubber feet on the upper and lower ends of the ramp are resting firmly on a stable surface (car bumper, sidewalk, etc.) before using. If the rubber feet are not firmly in contact with both a stable upper and a lower surface, the ramp could shift when used, putting your pet at risk for injury. To use Solvit's Telescoping Dog Ramp, follow the steps below. Set the ramp on the ground. Note: Some users prefer to extend the ramp first and then place on the upper and lower surfaces. The ramp is designed to hold itself in place when weight is applied, so there is no need for extra devices to lock the ramp in position. When you're finished using the ramp, just push the inner slide back into the closed position, re-snap the safety release tab, and stow in a convenient place. To prevent accidents, we recommend that you hold your pet’s collar or guide him or her with a leash while he or she goes up and down the ramp. Make sure pets walk only on the high-traction surface and stay away from the edges of the ramp. When using with vehicles, make sure your pet stays inside the vehicle until the ramp is deployed, then walk your pet down safely. The aluminum rails on the ramp are pre-lubricated with household paraffin wax. Some of this wax may flake off after repeated use of the ramp. Re-application of this wax should not be necessary under normal use. If the plastic or aluminum parts of the ramp get dirty, clean with any standard household cleaner. The tread material can be cleaned with mild detergent and a stiff brush or a strong jet of water. When you are ready to store your pet ramp or just need to take it with you, slide the telescoping end until the ramp is as short as it can be. Lock the ramp into place with the strap, and put it into the carrying case. For the safety of you and your pets, check ramp thoroughly before first use, and do not use if you discover any defects. 39"-72" x 17" x 4" and the tread surface is 13 inches wide. 47"-87" x 20" x 4" and the tread surface is 15 inches wide. 40" x 18" x 4"